or am I selling myself short? I gathered these flannels some time in the middle of the summer, of all things! I had just spent too much time drooling over the absolutely gorgeous Westminster/Rowan/FreeSpirit flannels that Marie carries over at good ol' Cool Cottons. At the time I was feeling purely selfish and had no particular design or goal in mind besides a comfy, cozy throw quilt that in no way will match any of my current decor! But I just don't care! This one's not for company, but for my own enjoyment! Though I got it pieced not TOO long after finding all of the fabrics, I wasn't feeling terribly rushed to quilt and finish this puppy up back in September. But now that we are most definitely into our winter season here and I have successfully gotten most of my Christmas gifts off to their proper recipients, I felt I could take some time on a personal project. 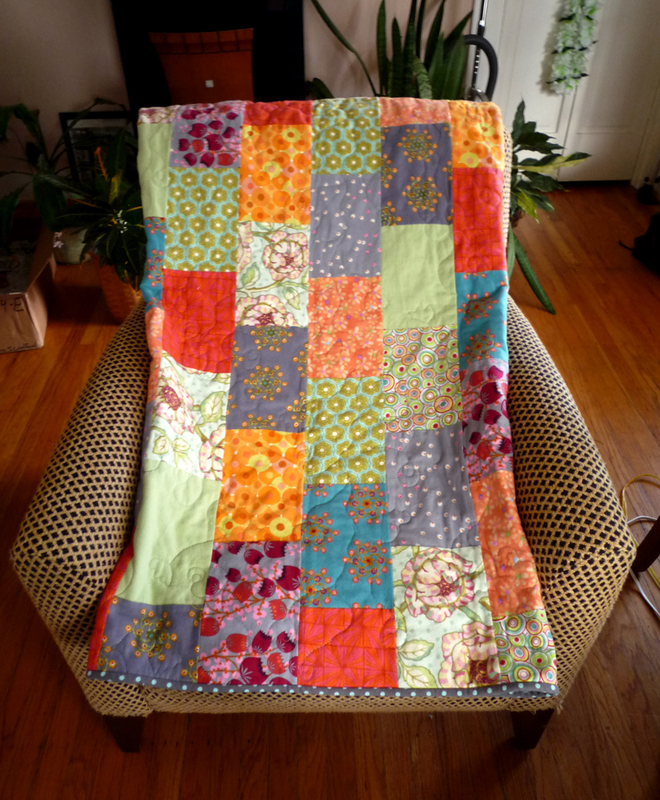 Plus, it was a good project to get reacquainted with free-motion quilting. It has been a while since I have played around with some FMQ (free-motion quilting), and I think that definitely shows, but when better to get some practice in than while working on a little project for oneself?? I'm looking at this as a warm-up for the baby quilt that is next in the queue and will hopefully be hitting my Etsy shop at the beginning of the year. That being said, I actually do have 2 more quilts basted and partially quilted, but not going to pressure myself to finish in the next day and a half (though I won't put aside the possibility of surprising myself!). All in all it's been a productive year, I think. Still working on building bonds and growing the business side of this venture, but I can confidently say that's moving forward. I just have to learn how to be a better office manager!